Regional rail is certainly not noisier than the state's busiest heliport across the street... since when does Duke care about the hill in Chapel Hill... and ED readers can look at the 2009 photo above and decide for themselves if Duke's parking deck creates an ugly wall between campus and town. It's too bad Durham's ridership numbers took a hit with Duke's actions. A regional rail station -- connecting Duke with the Triangle -- could have helped take down walls... Walls that Duke continues to put up (see new fences near Wallce Wade, see Duke closing streets near research buildings, see current efforts to gate Maxwell). 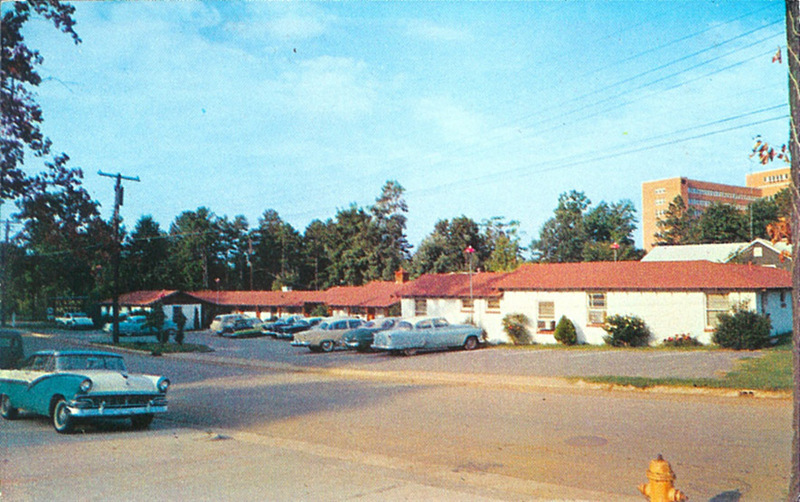 My grandparents Henry and Madge Harris managed (may have owned)the El Rancho Motel back in the 1950's when my father was a teen. When my family decided to move from Chicago to Durham in 1965, my mother and four kids drove down in the family Rambler station wagon to go house hunting. Relying on the Mobil Travel Guide for motel and restaurant ratings, we went for the "economy" motels. So we stayed at the El Rancho for a week and ate at the Blue Light every night. We dubbed it the "El Rauncho," but it certainly was affordable. "Hotel Rooms with private tile baths. Steam heated. 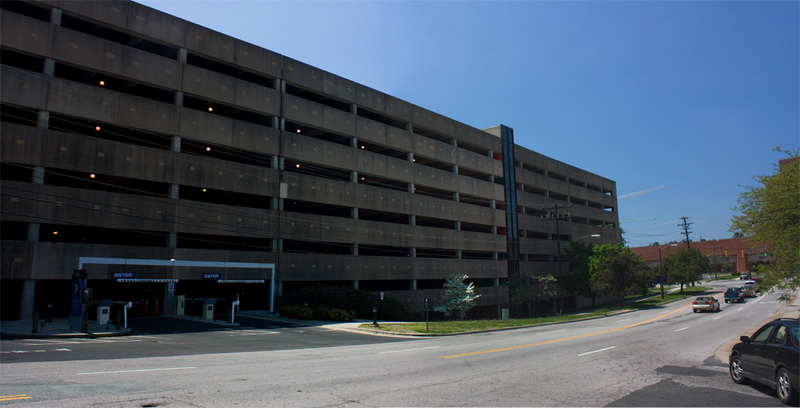 Located 3 blocks from DUKE University and Hospital. West Campus entrance on Erwin Street and one block from new Veterans Hospital. Take US 70A to West Main Street and 9th, then Erwin Street. Follow DUKE HOSPITAL SIGNS. Telephone 8-1223. Mr & Mrs Geo. C. Davis, Owners." 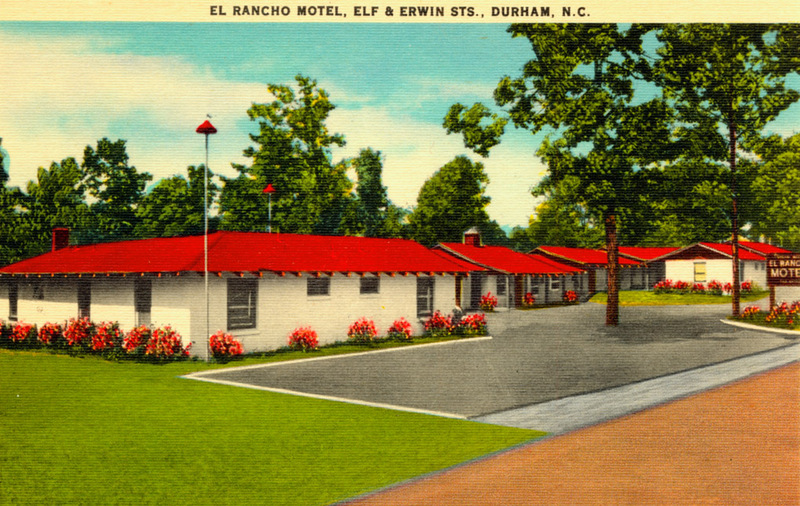 The El Rancho appears to have been gone by the 1980s, as was the connection of Elf Street with Erwin Road, taken over by a parking garage that accompanied the completion of Duke Hospital North in 1980. My name is Clayton Davis.